Recently on AtlantaCuisine.com, an Atlanta-based food website I frequent, the "cook-off theme" was chosen – and it was duck. This is a food that I don’t really eat that often and I certainly haven’t tried to cook it for myself. Serendipitously, the topic of this month’s Slashfood theme day was "D foods". After racking my brain and trying to think of how many things I could cook with daikon (the answer is none), I realized the dish I wanted to make would fit both themes. I can kill two birds with one stone! I made a Pan Seared Duck Breast with Pear Balsamic Compote with Shallot Reduction. I hang my head in shame to admit that this is an Emeril recipe. If it makes it any better, its from The Essence of Emeril – not that BAM! show. I really wanted to serve it with something winter-y and comforting. I knew potatoes wouldn’t do. I had seen delicata squash at the market and wondered if they tasted anything like a butternut squash. 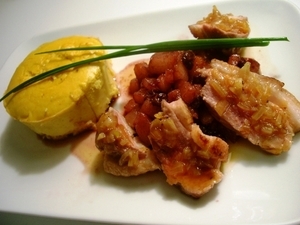 I thought the creamy texture of a winter squash would be a great accompaniment to the duck and the fruit compote. In search of a delicata squash recipe, I came across one for a Delicata Squash Flan. Perfect! Just what I was looking for….plus double D’s! It came out perfectly. The duck was easy peasy. The work was really in chopping a cup of shallots, babysitting the reduction for half an hour, and putting the flan together. Amazingly, all of the components got done at the same time (something I marvel at when it happens). I cooked the pears in Pinot Noir instead of the called for white wine – I think it perked up the currants and added a lot to the dish. The duck was mid rare and really took on the taste of the sauces. The shallot reduction was, well, spectacular. Oh yes…the flan. It was the creamy, mild balance I was looking for in the dish. I think this preparation would be great with pork, as well. Rather than eat up space with two long recipes (and since Typepad won’t show me how to make a cut in an entry – if anyone reading can help me, its much appreciated! ), I will link to the recipes I used in this dish. The only change would be the Pinot Noir substitution in the pear compote…and far fewer "Bam! "s and "Oh-yah-babe"s. Check out Food Network’s site for the duck recipe and Italian Cooking and Living’s website for the Delicata Squash Flan. It’s too bad you couldn’t wait until today (the 18t) to post your duck…it’s National Peking Duck Day. And, no, I’m not joking. I wish I knew how these holidays were created. Looks gorgeous, though. I need to break into cooking duck sometime soon. I’m a little nervous, though, just because I’ve never done it before. Yours looks perfect. Thanks! :) Duck *was* kind of nerve-wrecking. Its one of the very few things that I consider “restaurant-only”. That duck looks great with excellent colour, it looks to be the perfect pink – once you start cooking with duck you won’t stop and you’ll wonder why you ever hesitated in the first place. Great post. Feel no shame in cooking an Emeril recipe, especially when you loved the end product. I too participated in D Day, and I too made duck. Hope you get a chance to see it. As for your blogging frustrations with cutting your post, I too had the same problem with my typepad account. Turns out I just needed to upgrade my service level above basic. If you’re already upgraded to a higher level account, than I don’t know what the issue is. Thanks for the inside tip on Typepad. I am upgrading here anyday now (when I have more than a spare moment to reply to comments and then take off again). We’ll see if that fixes it. Tami, I actually think you can do the extended post thing. On the page where you post a new entry, look at the bottom for a “customize this page” link (not exact text, just what it means) and enable the options. Also, do you know about Food Blog S’Cool? (http://foodblogscool.blogspot.com/) Sam from Becks&Posh organized it to help food bloggers figure out the technical stuff. hi tami, what a coincidence that we both just recently cooked duck. i really liked the sound of your pear reduction sauce and will try that out sometime soon. I had the same dilemma with cooking fruit in white wine. Problem is, you can’t see it! A red wine will make the sauce truly beautiful.